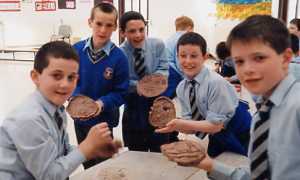 The eagerly awaited arts day festival commenced at the Abbey Boys Primary School, Roscommon on Friday last March 15th and will continue over the period from March to June on the Friday of each week. The school has organised a myriad of local talent who will bring experiences in the arts of music, dance, clay, drama and writing. The first instalment proved very successful with the visit of Padraig Naughton from Ballinasloe who gave all of the 170 boys the experience of modelling with clay. 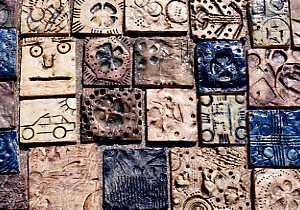 Padraig is a tactile and visual artist whose work covers a range of disciplines and a variety of activities. These include landscape drawing in charcoal and ceramic murals and installations with a strong emphasis on their tactile qualities. He is a graduate of the national college of art and design. On Thursday each class of boys from 2nd to 6th in turn enjoyed the day and many of their designs in clay were most artistic and revealing. Shapes were created and patterns were formed much to the pleasure and delight of the pupils themselves. It was most encouraging for the staff of the school to see the boys applying themselves to the assignments given, most of whom have never worked with clay previously. Great credit is due to the artist who, through his promptings, brought the best out of the boys. The Principal Mrs Hand is very thankful to all the sponsors who made the festival possible. The festival will continue on Friday next when the boys will experience the art of dance.